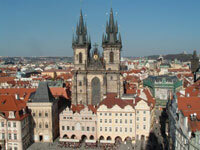 Following are some basic facts about the Czech Republic. For additional background and more detailed information (PDF format) about political history, spiritual landscape as well as Czech values, attitudes and habits please click the appropriate link. The Czech Republic is made up of two former historical regions of central Europe -- Bohemia and Moravia. The red and white of the Czech Republic flag is from the traditional coat of arms of Bohemia, a white lion on a red field. When the Czech Republic flag was used by the former Czechoslovakia, the blue triangle represented Moravia and Slovakia (blue was in their coat of arms). The Czech Republic (Ceska republika) is a landlocked country in Central Europe which is about the size of South Carolina in the United States. The country has borders with Poland to the north, Germany to the northwest and west, Austria to the south, and Slovakia to the east. The country is composed of two entire historic regions, Bohemia and Moravia, parts of Silesia and small sections of historic Lower Austria. The majority of the inhabitants of the Czech Republic (95%) are ethnically Czech and speak Czech, which as a member of the Slavic languages and one of the most difficult to learn. Other ethnic groups include Slovaks, Germans, Roma, Hungarians, Ukrainians and Poles. After the 1993 division, some Slovaks remained in the Czech Republic and comprise roughly 2% of the current population. Prague (in Czech Praha) is the capital and largest city of the Czech Republic. Situated on the Vltava river in central Bohemia, it is home to approximately 1.2 million people. Prague is widely regarded as one of the most beautiful cities in the world and so receives upwards of 4 million tourist per year which contributes heavily to the Czech economy. Nicknames for Prague have included City of a Hundred Spires, The Golden City, The Mother of Cities, and The Heart of Europe. Since 1992, the historic center of Prague has been included in the UNESCO list of World Heritage Sites. CZECH-AMERICAN TV Excellent site to learn about the Czech Republic including heritage, food, culture, traditions, language and sites. Click on Video Archive for a complete list of available programs and Radio for a sample of classic Czech music.